While David Cameron is touring China with his entourage of British business leaders this week, just a few hours to the south, Hong Kong is on a charm offensive of its own. The first StartmeupHK week starts tomorrow – a major project backed by the Hong Kong government and its inward investment arm, Invest Hong Kong - to show off Hong Kong to fast growth firms from around the world and encourage them to set up base here. And for entrepreneurs, the attraction is mutual. Just last month, Eric Schmidt was here talking about Google’s plans to tap into Hong Kong’s 'natively entrepreneurial' culture and help incubate startups in partnership with a local university. It is no surprise that the likes of Google are being drawn to the region, whose explosion of shared workspaces and tech incubators give it the feel of Shoreditch on steroids. With half the world’s population under a five-hour flight away, Hong Kong’s plans to rival London, New York and Berlin as the world’s tech destination of choice are well founded. Its routes into the Chinese and wider Asian markets give it an unparalleled geographical advantage, and it also boasts significant sector strengths in financial services and medical technology. It is clear is that the Hong Kong government has cottoned on to the contribution of a vibrant, international entrepreneurial community, much as the UK government has done with Tech City and there are clearly lessons being learnt and ideas being shared between London and Hong Kong. What’s more, Hong Kong doesn’t allow its ambition to be slowed by the barriers to progress that may exist elsewhere. When I lived here in the mid-1990s, the Hong Kong government had confirmed plans to shutter the old airport – the notorious Kai Tak – and build a state of the art international airport on Lantau Island. That construction was completed in a matter of years along with a modern railway extension that now whisks people in to the Central business district in minutes. Compare that to airports policy in the UK, or the progress of a major infrastructure project such as HS2. 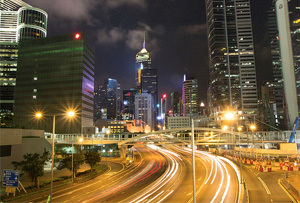 Boasting such enviable connectivity, Hong Kong is not shy in showing the world it is open for their business. Last month, Financial Secretary John Tsang was in London, where I heard him chart Hong Kong’s journey from a manufacturing base into a global financial centre and services economy. As he wrote in the Sunday Telegraph last week, the 'Made in Hong Kong' label has been replaced by 'Financed in', 'Designed in' and 'Conceptualised in'. This week, a dozen finalists, from nearly 400 international applicants to bring their company to Hong Kong, will pitch in front of 500 experts from the region’s business community. The audience will comprise Chinese entrepreneurs, high net worth individuals, representatives from Chinese family businesses, Chinese students, local entrepreneurs, VCs and private equity professionals. The finalists are bidding for a top prize comprising funding, practical relocation support, office space and other invaluable in-kind benefits that will help these nascent firms get a foothold in one of the world’s most dynamic markets. For the business leaders travelling round China this week, perhaps they should have added Hong Kong to their itinerary. Despite its familiarity, there is a great deal of new and exciting work here to admire. For British startups looking to follow the prime minister’s lead and tap into the Chinese market, they could do a lot worse than pay a visit to Hong Kong – it’s on the path to being Asia’s startup capital. - Nick Giles is co-founder of the campaigns business Seven Hills and UK ambassador for Invest Hong Kong's StartmeupHK programme.